The Japanese went back to Japan in 1946 (see here), but when did the Taiwanese stranded outside of Taiwan start coming home? 民報, a newspaper published in Taipei, reported on Dec 24, 1945, that on the previous day, the first group of 865 Taiwanese had arrived in Keelung; 259 were on board the IJN No 44 海防艦escort ship [patrol boat] arriving at noon and the rest on the transport 夏月Natsugetsu [a converted destroyer], at 5PM. Both ships departed 加治木Kajiki, 鹿兒島Kagoshima on the 21st. And 153 of the 259 sailed on Nov 4 from the Philippines to Japan and then joined the others. At 9PM, this group arrived by train in Taipei Station into the welcoming arms of the happy family members. (4) In Japan, several thousand apprentice soldiers and military employees from Taiwan were all safe and sound. The editorial at the top was in support of the gov't's taking over the businesses previously nationalized by the Japanese - if the bureaucracy could be avoided. There is also a list of the price of various food items. And of course the inevitable advertisements, at the bottom: Movie theaters were showing Chinese and Japanese movies. A dance studio was recruiting ballroom-dancing students. And a hotel, a restaurant, and a tea house looking for clients plus an announcement of the opening of a new movie theater. Gen Douglas MacArthur denied for the second time that he had resigned and claimed that he would be in Japan to complete his duties, not to obstruct American policies. Three high-ranking Japanese officers and 40 soldiers in Borneo were being tried for committing war crimes - in the killing of 550 British POWs. In 中壢Chung-li, a "bad-egg" Japanese official was found to have destroyed maps/documents on the irrigation system. In Kaohsiung, the 64 Aboriginal 社s (population 22,058) would now convert to self-ruling 村s. And 1,774 students took the first post-war entrance exam to National Taiwan University. At the bottom are the weather report, a treatise on 魯迅Lu Xun's poems (Lu, a famous Chinese poet who briefly studied medicine at Tohoku University in Sendai, Japan), a new-style poem (part 2) by an unknown poet, and Sec 23 of a long novel by 吳漫沙 (a famous author born in Hokkien). Preparations for the New Year's Day celebration were also underway. Koxinga was a King who commanded a very well-structured military of some 100,000 men. He was 延平王 (King of Yan-ping) and whose war-machine was respected and feared at once by all who had crossed his path, unwittingly or otherwise. This path was actually a very narrow one: 反清復明[Rebel against Qing and restore Ming]. Period. Koxinga was educated a Confucian scholar who later, at age 23, became a military leader under very trying circumstances: First his father 鄭芝龍Cheng Zhi-long surrendered to the Qing violating a cardinal Confucian rule of honoring thy emperor at all costs, then his Japanese mother 翁夫人Lady Wuon (aka Mrs 田川松Takawa Matsu氏, 翁 was her adoptive parent's name) committed suicide when the Qing invaded Koxinga's hometown. He burned his scholar's robes at the Confucius's Temple bidding farewell to a university student's life forever, and answered the personal call from the Ming emperor to rescue the latter's failing dynasty. 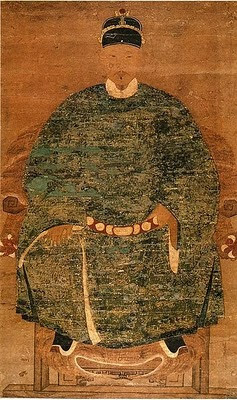 The emperor-in-exile 隆武Long-wu rewarded him by conferring the honor to use the royal family name "朱" [hence 國姓爺 as he was respectfully referred to by the common people] - the emperor did not have any daughters to marry Koxinga into the royal family. And the last emperor-in-exile 永曆Yon-li promoted him to a second-tier kingship 延平王. 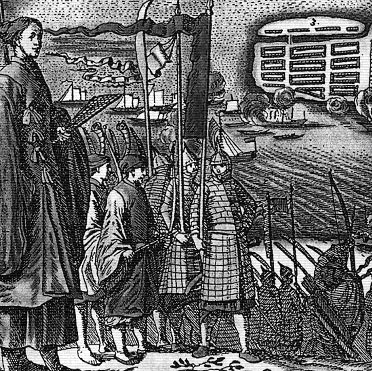 The title 延平郡王 was a posthumous honor from the Qing emperor 光緒 in 1875 - by then all were forgiven and Koxinga was regarded a Chinese hero for driving away the Dutch from Taiwan. It was a politically expedient way of rallying the Taiwanese during the Sino-French war era that is to continue to this day. And whatever had happened to the Ming-Cheng soldiers in the penal colonies in mainland China has remained totally ignored, also to this day. And the Army was organized thus: (1) Guardsmen of several special forces directed by Koxinga himself and (2) General Troops under various commands. The latter consisted of 9 different infantry groups ranging from 5 specialty companies to 28 squadrons in each group. One of them, the 後勁營 (the Rear-Guard Battalion) was built with Northerner Chinese. The special forces included (1) the Left and Right Martial Guards (or the Golden-armored battalions - infantry with traditional Ming armor); (2) the Left and Right Tiger guards (i.e., the Iron-man Corps); (3) the cavalry battalion; (4) the artillery battalion; and (5) the palace guards - including a Black matchlock rifle battalion. A battalion of Black soldiers? Yes. 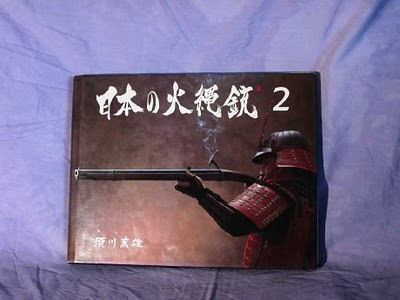 And they were specialists in the use and maintenance of the 種子島[銃]Tanega-shima matchlocks purchased from Japan. They were also able to produce these rifles, known as 倭銃, later on. Blacks from South Africa (the Cafres) (and later also from South Pacific and East Asia) began to arrive in China at the end of the Ming Dynasty. Some were brought in by European traders as slaves/servants. Others had enlisted to serve in the military of the Portuguese and the Dutch for religious reasons, i.e., to spread Christianity in the East. And their bravery and fighting capabilities were quickly noticed by the Ming-Chinese. In the early 1600s, most of the Blacks resided in Macau. They in fact were the main component of the Portuguese contingent who had fought off the Dutch in 1622. There was a report noting a female Black warrior, in man's garb, who had single-handedly killed 2 Dutchmen in this battle. In 1647, about 200 of the Macau Blacks sought freedom as well as a better life. They left Macau and went over to Cheng Zhi-long in Hokkien who eventually employed 300 as his personal guards. Cheng had consistently honored their Christian belief possibly because he himself was once a Christian. A side issue here: Labeling Cheng Zhi-long a "pirate - one who engaged in robbery at sea" was incorrect. 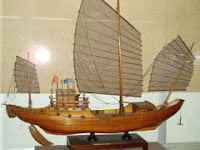 To the Chinese merchant ships, his privateering navy provided much needed protection in the trade routes between China and SE Asia from harassment by ships of dubious origins. His operation became legit later when he joined the Ming (1628). Then he unwisely defected to Qing (1646) and tried to convince Koxinga to do the same, in vain. He was eventually executed by the Qing on the 3rd day of the 10th month in 1661, together with 10 family members, including his 3rd son 世忠(世渡), 4th son 世恩, 5th son 世蔭, and the youngest 7th son 世默. This news hit Koxinga hard, who went into deep depression and passed away soon after at age 39. Koxinga inherited these palace-guards and had also welcome them with open arms - even into his own household. In return, these Black warriors were fiercely loyal to the Chengs. 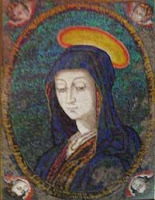 In battle, a banner with the image of Virgin Mary on it was proudly and prominently displayed. This Black Battalion was headed by a very talented Luis de Matos. They were usually deployed on the second line in support of the first-line offense. In the siege of Nanjing, they were seen fighting at the foot of the city walls near Yangtze River. And in the siege of Zeelandia, Koxinga's Black soldiers were able to communicate with the Blacks enslaved by the Dutch inside the fort, many escaped from it to join the Cheng army. No one knows what had happened to the Black Battalion and their families [some had married Han wives] after the demise of the Ming-Cheng Kingdom. It was unlikely that they were sent to Mainland China or repatriated to Macau or even less likely, back to their homelands in Africa/Asia. There were no such records in any case. Most probably the 300 or so of them were simply disarmed and allowed to stay and die forever Taiwanese. Presumably a contemporary German made the above sketch of Koxinga's Iron-man Corps, one of the many special forces of Koxinga's army. It shows infantrymen who donned a helmet, face mask, heavy chest and arm fish-scale armors, and a long heavily-armored skirt. They each carried a long spear or a broad-blade at the end of a stick - weapons for cutting down enemy cavalries. They were also accompanied by the rattan-shield infantry who erected inch-thick curtains to catch arrows and bullets. According to Chinese accounts, however, both arms and legs of these iron-men were exposed - for easier movement. And they went bare-footed for more steady footing. The Qing strategy of targeting their feet with arrows failed because the Iron-men would simply pluck out the arrows when shot and fight on oblivious to the flesh wounds. The source of these armors was unclear; although it was most likely Japan: (1) there had been active trading between the Cheng Clan and Japan since the days of Koxinga's father, 鄭芝龍Cheng Zhi-long (1604-1661), who controlled the eastern seas of China; (2) Koxinga himself had grown up in Nakasaki, Japan, who might have seen the armored samurai in action; and (3) the face masks were known to be worn only by the Japanese (not Chinese) warriors. The picture on the above left, i.e., a 16th Century armor-suit worn by a high-ranking samurai, might have been just that used to outfit the Iron-man soldiers [without the arm and leg guards]. The selection of these men was quite rigorous. Each recruit must be able to carry a certain weight and with it ran a certain distance to qualify. Power and endurance were both prerequisites for wearing the heavy armors (weighing about 33 lbs) and fighting at the same time. About 5,000 were chosen during the first screening. Some reports mentioned Japanese and Caucasian participants. That would not be so surprising as the Cheng army did invite other people than the Hokkienese to join up. This special force, numbering about 3,000 (up to 10,000), was part of the 左 and 右虎衛營 [Left and Right Tiger Guard Battalions] under the direct command of Koxinga. Its basic unit was a 6-man squad equipped with the heavy sword 雲南斬馬刀 (2), shields (2), bow and arrow sets (6). Also, for each 10 squads, 4 specialized in attacking with bow and arrow and the other 6, sword and shield. They were trained to fight as one, any disruption to the formation, by either advancing or retreating, especially the latter, was severely punished. On the other hand, they were handsomely rewarded after each victory and were paid 3 silver taels each month [double the regular army pay]. The unique weapon here was the razor-sharp 雲南斬馬刀 or Yun-nan horse-slaying saber-sword. Yun-nan was just its name, had nothing to do with the Yun-nan province. Legend has it that each blade was made by passing serially through 100 iron-smiths who hammered it into shape. This may have been a process similar to the samurai-sword-making in Japan, a long piece of soft iron core folded onto itself thousands of times (to give it flexibility) which was then encased in a hard steel shell (for sharpness and strength). And this is done by only one master plus 1-2 assistants. With 100 masters working at the same time, mass-production of the horse-sabers was therefore possible. The Dutch defenders of Zeelandia had calculated that one Dutch soldier could fend off 25 of Koxinga's iron-men. They were fatally mistaken. 淡水福祐宮 or, to the locals 媽祖宮Ma-Zu Temple (first built in 1796), the headquarters of the defending Qing Army during the Battle of Fisherman's Wharf in 1884, is now in danger of toppling over. Well, kinda. This can be an optical illusion but not really - measurements have confirmed this micro-scale leaning tower of Pisa. What has happened? If you look at the area (see map here): To the immediate right of the temple, a narrow alley leads uphill to 重建街. It branches off to the right to 清水祖師廟. 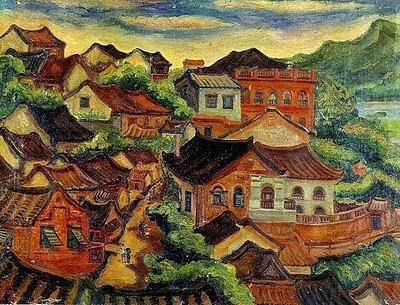 And off the left of 重建Street, there is the 紅樓 (the Red Castle), a western-style structure built in 1899 (see painting below). It was this distinctive-looking building that might have been mistaken for a military post and attacked on Oct 12, 1944 by the American F6Fs. In fact, this area, i.e., the backside of Ma-Zu Temple, appeared to have been strafed by machine guns and either rocketed or even bombed. No one knows for sure as most residents had evacuated to the countryside north of Danshui. This, most likely an accidental hit, could have shaken the foundation of the temple and the damage, exacerbated by earthquakes, is just now becoming apparent. You'd think the locals would sprint into action and repair the walls promptly. No, not at all. In fact, "not so fast" as a permission must first be granted by Ma-Zu herself. This seemingly supernatural yet a real requisite as far as the locals are concerned can come in many forms. There has been none so far. The locals know from years of experience that it is unwise to act unilaterally from the human end or risk inviting misfortunes - just ask the few hapless merchants who had rented properties from the temple in the past and neglected to seek Ma-Zu's approval for one deed or another. No one dares to question why the omnipotent sea-goddess Ma-Zu allows this to happen to her own house. Let's just say common folks will never really understand her mysterious ways. Here is a thought: Next time when you visit Danshui, take a close look at the front walls of Ma-Zu Temple. Then go inside and visit with Ma-Zu. Who knows, you maybe the next messenger to tell Danshui-ren, "the reconstruction shall now begin". We now have two pieces of credible information on the Chinese air raid on Taiwan in Feb, 1938 (cf previous post here and for more information by Patrick Cowsill, here). 5. The Sunday after the bombing, the author's father led the family to visit the bombed site, and the oil rigs appeared undamaged. There you have it then: Chu-tong, not Hsin-chu was bombed but suffered no damages. As for the date of the air raid, Dr 黄称奇 in his memoir "末代の二等兵" recounted, "... 但し、支那事変以来としては、昭和13年、の2月22日が最初、中国空軍に依る、新竹油田、台北松山飛行場...", i.e., the first ever air raid on Taiwan by the Chinese Air Force was on Feb 22, 1938, targeting Hsin-chu [should have been Chu-tong] oil fields and 松山 Airfield. 這是因為拼音方法不同, 漢語通用Wade-Giles三種拼法並存. Danshui這個地名只使用大約10年,以前不曾有. 滬尾 (Huwei, 本地發音Hobe) 則是舊名,但到現在還通行. There are at least two forms of English spelling of 淡水, "Danshui" and "Tamsui" (plus a less common third, "Danshuei"). "Tamsui" is used by the Town Office, the Oxford University, the Cultural Foundation, and in old maps such as that used by the French during the Sino-French War. 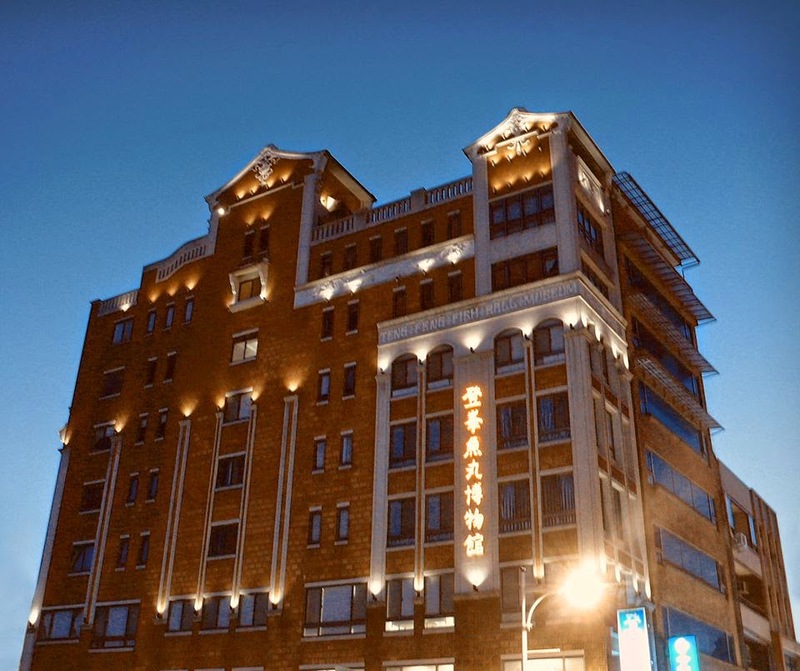 While others, including the Historic Sites and this blog, favor "Danshui". The difference originated from the three co-existing ways of Wade-Giles spelling; although the use of "Danshui" started only 10 years ago, unknown before then. Also, Huwei (for the locals: Hobe) is an old name but is still in use today. Welcome to 淡水/Danshui/Tamsui/Danshuei/Huwei (Hobe). And please visit our Special Exhibition on Sino-French War, during which a battle was fought at Fisherman's Wharf on Oct 8, 1884.